It’s been quite a while since I’ve blogged. I was hoping my blog would come following Sunday, my first half marathon. Well I can’t hold it in anymore. I apologize in advance if you are reading this, it’s going to be scrambled and all over the place… I just need to vent a little. I’m dying with anxiousness and I’m terrified. I cannot trust in the training, I’ve failed to train properly, I slacked and did not follow my plan. I did not reach the maximum distance nor did I do strength training or hills or speed training. I am utterly out of shape and the heaviest I have ever been in my entire life. Gaining 7 pounds in the last month alone… On top of all that, I am injured. I have been seeing a chiropractor/sports doctor for the last two weeks after injuring my knee two weeks prior to that during an 8km race to get the season started. I destroyed my knee that day and rested an entire week, ran and found myself in excruciating pain again. I couldn’t walk. I couldn’t move. Laying in bed was painful. I had given myself patellar tendinitis. Okay fine we figured it out during the first diagnosis and the doctor did some therapy (ultrasound? andd laser) and acupuncture… First time.. Weird. I didn’t enjoy it. Next morning after my first treatment, my foot hurt, a lot, and I was off to a 10km race… So, I did the race in a lot of pain, saw the doctor a handful of times since to treat both my foot and knee and I’m still in pain. I can’t even run 2kms without feeling like my foot is going to rip apart, how am I ever going to finish 21k?!!!! I just want to curl up and cry because I want to do this run sooooooo bad. At this point I’ll most likely be walking it but that means 4+ hours for what I was hoping for 2 ½ hours. I guess the time doesn’t matter really anymore. 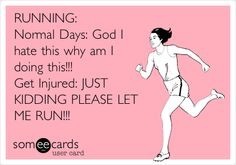 I just want to be able to finish, not be in pain, and be able to walk afterwards. My knee is aching and my foot is throbbing. I just did less than 2 KMs of WALKING…. This is going to be the biggest challenge I’ve ever faced. Please don’t lecture me or try to talk me out of it. I understand. My common sense says yes I should sit this one out, no harm no foul. My stubbornness and determination says I signed up, this is what I wanted, why not try instead of giving up?!! I realize I can injure myself more and feel even more useless than I do now but I will spend the rest of my life wondering what if. That is all. That is where I have been lately. Being depressed about my weight, not comfortable in my own skin at all, not running, eating like a fatso, and doing nothing about it.